The Armenian Revolutionary Federation Bureau vehemently condemns the terrorist act committed within Armenia’s National Assembly–during which Armenia’s prime minister–speaker of the National Assembly and others were killed. The impetus behind this crime will surely be revealed in the near future by the authorities following their investigation. However–independent of what the investigations will reveal–we affirm that this crime aimed at endangering Armenia’s domestic stability–the strengthening of democratic processes and the state’s specific policies of domestic and economic reform–as well as Armenia’s international stature. At this juncture–we reaffirm our solidarity with the leadership and the people of Armenia–in order that the heavy losses suffered by the people as a result of this crime does not provide an opportunity to undermine the positive developmen’s–and will allow Armenia’s leadership to continue the realization of national aspirations–as well as policies aimed at straightening Armenia’s international stature and domestic reforms. In the name of the Armenian Revolutionary Federation Bureau and the entire ARF establishment–we unequivocally condemn the crimes which took place at the Armenian National Assembly–as a result of which Armenia’s National Assembly Speaker–Armenia’s Prime Minister–other ministers and members of parliament were murdered. We express our deepest condolences to you–the Armenian people and the nation. We believe that this criminal act–which threatened Armenia’s stability and democratic processes will not succeed. 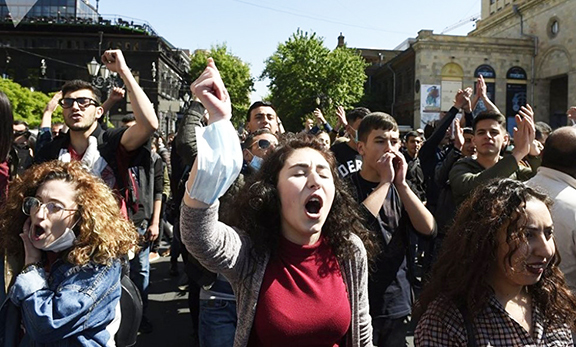 We–once again–reaffirm the ARF’s mission t stand in solidarity with all efforts by the Armenian authorities which aspire to the stabilization of Armenia and the strengthening of democracy.